Revised, republished edition, 2013. 8vo. Black and white photographs. Rev. 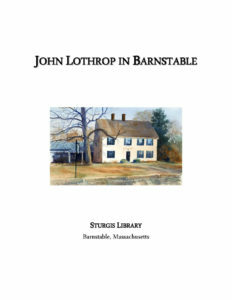 John Lothropp arrived in Barnstable, Massachusetts on Cape Cod in 1639, and his meetinghouse, which is now the Sturgis Library, was constructed in 1644. He was one of the founders of the Town of Barnstable. Contents include biographical and historical information on the Rev. 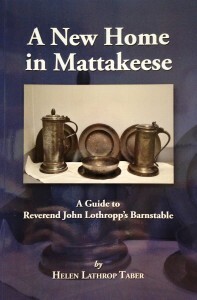 John Lothropp, his congregation, his historic Bible (which is now on display at the Sturgis Library), his meetinghouse, and sites around Barnstable related to Lothropp. This edition was revised and republished after author Helen Taber’s death, and includes new photographs, essays, and updated information. An important resource for genealogical researchers, historians, and members of the Lothrop, Lothropp, Lathrop, Lathropp, Lowthorpe, and allied families. Stop by the Sturgis Library and pick up a copy. They sell for $15.00 each. “Buy it now” on ebay with a credit card or paypal payment for $18.00 (includes shipping & handling). Click here to purchase your copy on ebay. Send a check or money order for $18.00 (includes shipping & handling) to Sturgis Library, Attn: Lucy Loomis, P.O. Box 606, Barnstable, MA 02630. Please include your mailing address. Compiled by Lucy Loomis. Barnstable, MA : Sturgis Library, 2011. Second edition, revised. 4to. 58 pp. Color photographs. Contents include biographical and historical information on the Rev. 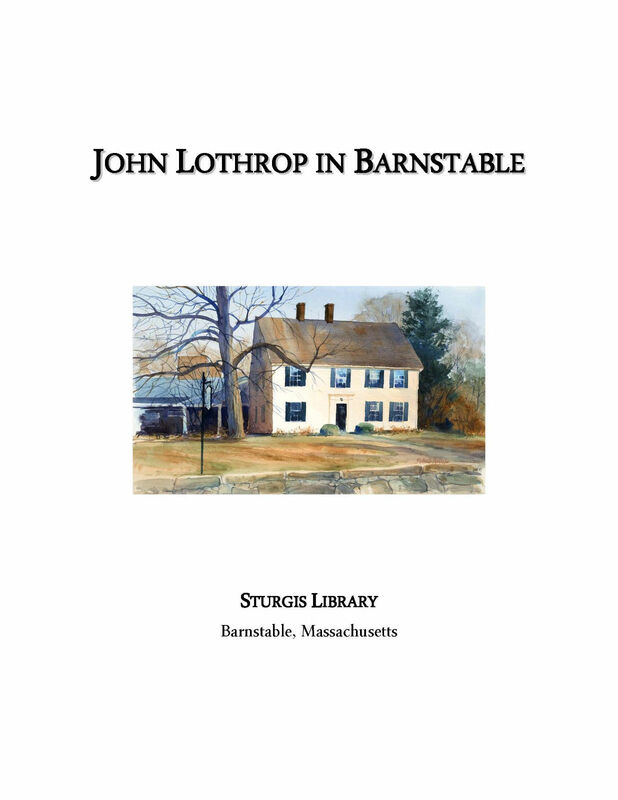 John Lothrop, his congregation, his historic Bible (which is now on display at the Sturgis Library), his meetinghouse, and a history of the building and its inhabitants from the time it was a meetinghouse to the present day. It also includes a full transcript of Lothrop’s diary, and photographs of the Sturgis Library and the Lothrop Bible. It concludes with a list of resources and websites. This is an important resource for genealogical researchers, historians, and members of the Lothrop, Lothropp, Lathrop, Lathropp, Lowthorpe, and allied families. 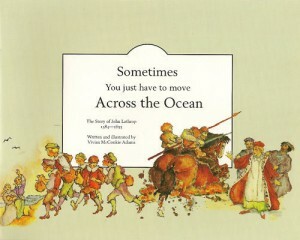 Written and illustrated by Vivian McConkie Adams. American Fork, UT : Pitchfork Publishing, 2010. Second edition, revised and corrected. Oblong 4to. 29 pp. Color illustrations. A charmingly written and illustrated book for children which tells the story of Reverend John Lathrop / Lothrop, one of the original founders of the town of Barnstable, Massachusetts. Lathrop, who had been jailed in England for his religious beliefs, journeyed across the ocean with his followers to settle in the new world. They originally landed in Scituate but soon afterward settled on Cape Cod. Many famous and not-so-famous Americans are descended from Reverend John. Stop by the Sturgis Library and pick up a copy. They sell for $12.00 each. “Buy it now” on ebay with a credit card or paypal payment for $15.00 (includes shipping & handling). Click here to purchase your copy on ebay. Send a check or money order for $15.00 (includes shipping & handling) to Sturgis Library, Attn: Lucy Loomis, P.O. Box 606, Barnstable, MA 02630. Please include your mailing address.